Well this is a ridiculous recipe if ever I saw one. I mean, who would ever have left over Lindt Lindor balls hanging around uneaten? But, first things first, last week was another fantastic Festive Food Friday linky on the blog. Some of my favourites from last week were Olive, Tomato and Herb Christmas Tree Bread from Tales from the Kitchen Shed, White Chocolate Cranberry Fudge from Misplaced Brit, Baked Camembert with Chilli Jam and Rosemary by De Tout Coeur Limousin and Rudolph Cake Pops by A Strong Coffee. I have a bit of a all or nothing nature you know. (I can hear my friends snorting at the word ‘bit’..) This means that for 11 months of the year I am unable to have Lindor balls in the house. I. Cannot. Resist. Them. That melting centre that somehow feels colder than the rest. I’m not sure why, but they feel very festive to me. Perhaps it’s the red packaging or the fact that Christmas is my self made opportunity to fully indulge in them. So, what could be better than eating a box of these with a cup of tea in front of the fire? Eating them encased in a chocolate brownie of course. The balls turn into a rich, gooey, dense truffled centre. These are about as rich as any treat could be, but hey, it’s Christmas! 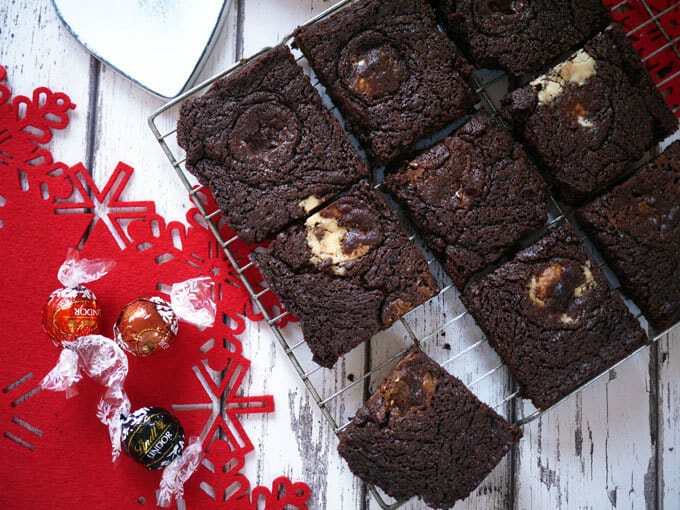 Delicious chocolate brownies with a hidden Lindor Lindt surprise. The night before you start, freeze your truffles in their wrappers. The day you want to bake, pre-heat the oven to 180C. Line 2, 25cm x 25cm tins with baking paper. Melt the chocolates, butter and sugar together over a low heat. Once they are melted, remove from the heat and leave to cool for 5 or 10 minutes. Beat in each egg, one by one. Pop 9 unwrapped truffles in each tray, spacing them evenly so you get a truffle in each bite. Share the rest of the batter out between the two tins to cover the truffles. Smooth out with a spatula (there will still be bit lumps where the truffles are, but just make sure they are covered with batter so they don't melt too quickly in the oven). Bake for about 20 minutes. A skewer should come out only just clean. You could test at 17 minutes and again at 20 minutes just in case. As always, remember that depending on your oven it could take up to 10 minutes longer, but please please try not to overcook them. Brownies are always better under-done than over. Wait until totally cold (sorry, a pain I know) before cutting and eating. Each week I’ll pick the most mouthwatering/funny/calorific and repost them. You can follow me @tamingtwins. Please say hello! You can add up to 3 posts each week if you’d like. 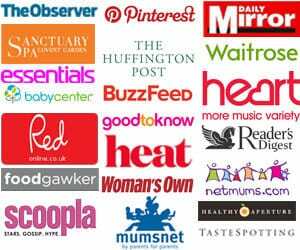 I will pin all of the posts added to my Pinterest board, which has over 70,000 followers. The linky will be open until Wednesday the following week. Please visit and comment on at least 2 of the other posts that have linked up, per post that you add. Spread that Christmas cheer! If you follow me on Twitter and tweet a link mentioning @tamingtwins and #festivefoodfridays, I will RT them. Each week I will write a round up, linking to some of my favourite posts from the week before. 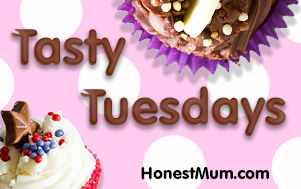 Can’t wait to see what festive makes and bakes you have in store this week! 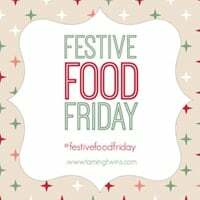 Don’t forget to share on Instagram too by using #festivefoodfriday. These brownies look so yummy Sarah! 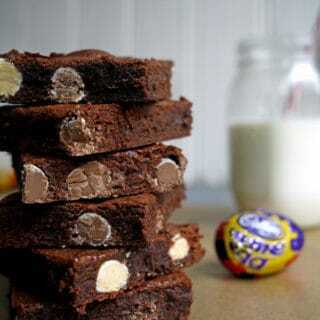 Wow, those brownies look incredible, Lindor balls in brownies is my idea of heaven! Oh my… get thee behind me Satan!! Look at the state of those… I don’t realyl eat milk chocolate any more but I make an exception for Lindor balls. 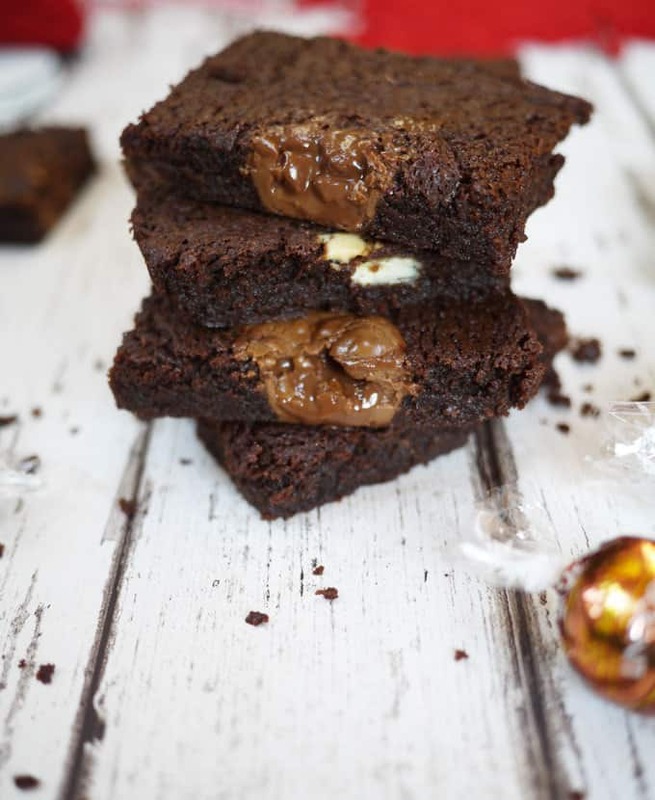 Such a great, decadent idea to use them in brownies! 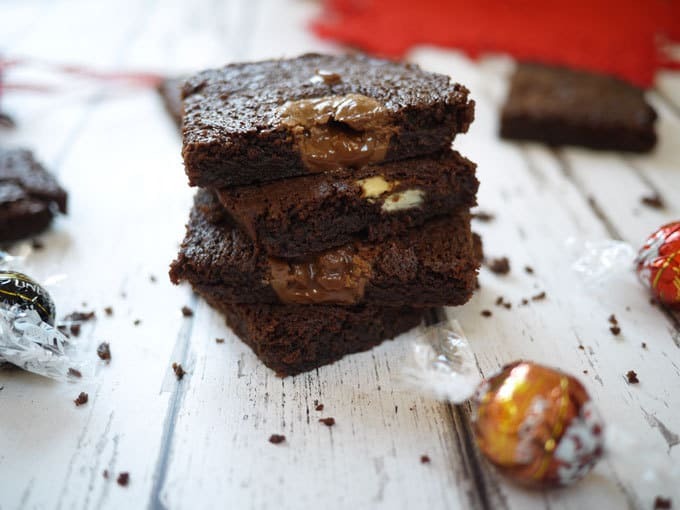 Oh my goodness these brownies look absolutely amazing, I’m going to have to go out and buy a packet of Lindor truffles ASAP! OMG what are you trying to do to me??!! I love lindor chocolates. I cannot imagine your brownies with them in! Aghhh!!! I am supposed to be avoiding sugar!!! And 70,000 Pinterest followers??? That is incredible! I thought only famous people had that many so you must be famous!! Oh heck I’m so with you on the Lindor chocs – as soon as they cross the doorstep they’re in my mouth! Left overs to bake with? 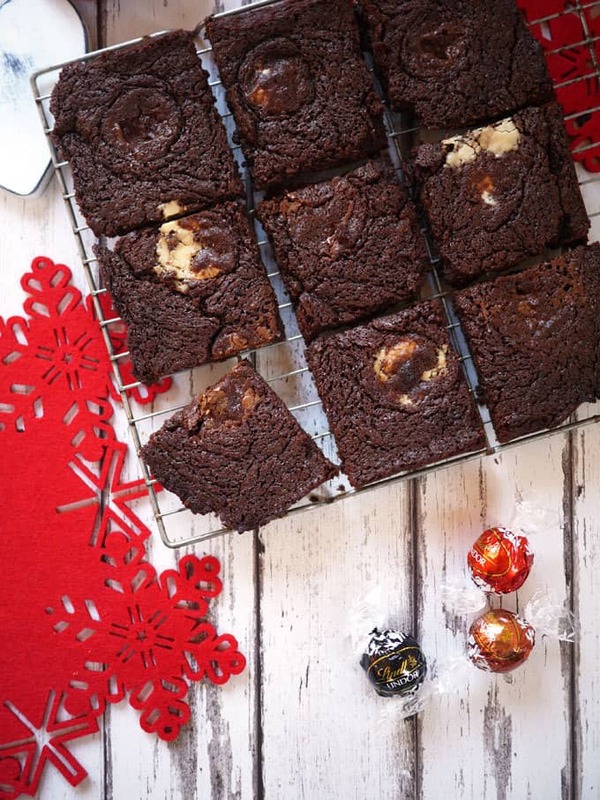 Ha ha *collapses in laughter* … still these brownies do almost look worth keeping some aside! Oh goodness me, my mouth is watering after reading this post and seeing the beautiful pictures!! I’m going to have to try this one. 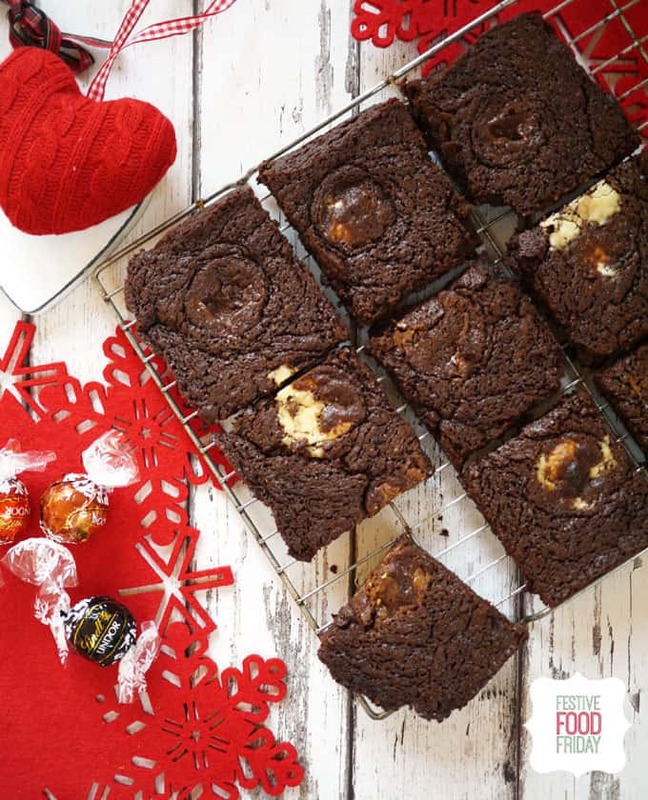 Have you seen my gluten free chocolate brownie recipe? We had tonnes of Lindt truffles leftover from last Christmas that were given to us as a Christmas gift and they were past their best before date, so not ideal for eating on their own, but still perfectly tasty (inside just not as soft). Went in search of a recipe to use them up and came across this! Turned out AMAZING. I didn’t even use ANY proper baking chocolate or any other chocolate bars – I froze the hazelnut and the white chocolate truffles ones, then melted the dark and the milk ones, in rough proportion to your recipe. I thought they’d turn out too sweet, but I really wanted to use up the chocolates. They’re DELICIOUS. However, I had a smaller baking tray from the dollar store and the recipe filled it out just enough so I’m not sure how it would have went with a 25×25 tray. Thanks a bunch! !